He is the most experienced trainer of thinking, public speaking and debate skills in Estonia, practicing rhetoric, debate and public speaking since 1994. Since 1998 he has conducted trainings of persuasion, discussion and decisionmaking based on argumentation for managers and professionals, has moderated discussions in seminars and conferences. Margo has trained and consulted numerous private sector executives, communication professionals, radio show hosts, teachers and professors, public sector officials, non-profit activists, start-up and social entrepreneurs, among others. His recent clients include Pipedrive, IF Insurance, Sanofi-Aventis Pharmaceuticals, Estonian Energy, National Audit Office, Äripäev Academy, Government Office, Rescue Board, Tartu Biotechnology Park, Linström, Prisma Retail, Police- and Border Guard, Tax and Customs Board, Clinic32 Dentists, Lentsius & CASUS Law Office, Tartu University, Transferwise and the Estonian Defence Forces. In addition to working as a trainer, Margo is also SpeakSmart development manager, Chairman of the Board of Estonian Network of Nonprofit Organisations, volunteer member of Opinion Festival organising team and manager of civic technology initiative CitizenOS. Teaching experience: Margo has conducted the activities of debate clubs and taught speech and debate in Tallinn 21. School, Estonian Business Grammar School, Old Town Educational College, Rocca al Mare School (for 10 years) and Tallinn University. Competitive debating achievements: Margo was K.Popper Debate World Championship Best Speaker in 1996, founding member of NGO Estonian Debating Society in 1998, its president in 1999-2000 and member of supervisory board 2002-2005, Convenor and Chief Adjudicator of Estonian Debating Championships 1998-2004, Chief Adjudicator of National Public Speaking Competition. Margo works as a moderator under SpeakSmart moderaator.ee brand and is also a trainer of moderators. Best trainer in my long list of trainings! The training surpassed my expectations. Theory was clear and balanced with a lot of practice to learn how to apply it.Trainer was professional, interesting to listen to and could keep our attention up for the full 8 hours each day. Margo is a superb professional of his field! Examples from his own practical work and a very good knowledge of the entire communication background make Margo a skillful and persuasive trainer. Thank you! Expert of his field, who can point to skills that can be developed in every situation and give practical advice about them. Both training and trainer were well prepared, peaceful, honest, creating a focused yet friendly atmosphere. 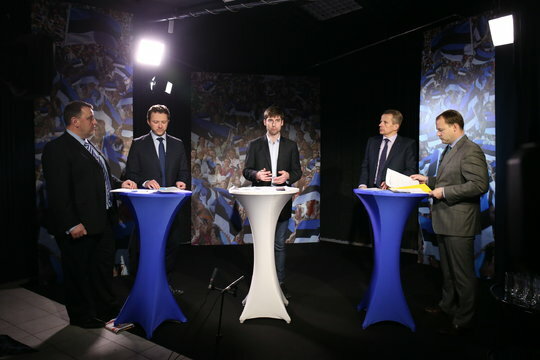 Margo moderating Electoral debate for Chancellor of Tallinn University in March 2016 video and pictures. 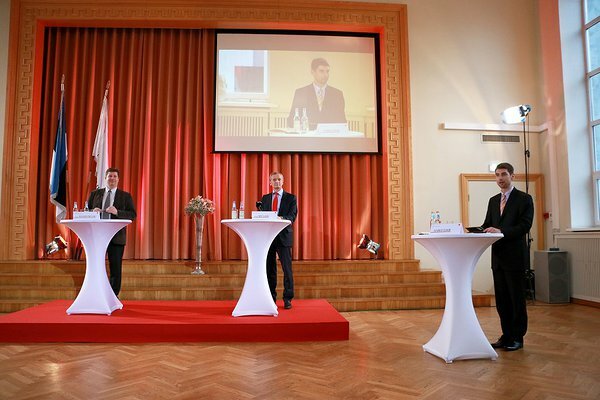 Margo moderating discussion between chairmen of all parliamentary parties at Opinion Festival 2015. Margo speaking at TedX Tartu 2015. Margo modrating national elections online debate in 2015. Click to watch video.